Ed Force One, the custom plane piloted by IRON MAIDEN singer Bruce Dickinson, and carrying band members, crew and equipment, touched down on the tarmac at Los Angeles International Airport to a huge throng of fans who had waited patiently for hours, along with their trusty cell phone cameras, to greet their heroes as they arrived for a pair of shows at the remodeled concert arena The Fabulous Forum. After a very upbeat, loud, and exhilarating set from THE RAVEN AGE, a five piece band that featured IRON MAIDEN bassist Steve Harris’ son George on guitar, it was time to get primed and ready. The concession stands were doing a brisk business with $45 T-shirts and such, and the bars were selling a lot of $13 a can “Trooper Beer”, which is the official beer of IRON MAIDEN, brewed by Robinsons Brewery in Great Britain. All this and more added to the festive atmosphere. At promptly 9:00 PM, the UFO classic “Doctor, Doctor” was cranking through the house PA system, the audience waved their arms to the beat, and a huge roar greeted the dimming of the house lights. I LOVE this particular moment at rock shows. The anticipation is at a fever pitch, as the partisan crowd awaited the appearance of the conquering heroes. Energy abounds. 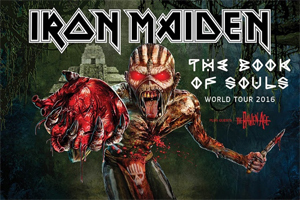 A computer generated video featuring their mascot “Eddie” as well as “Ed Force One” played from the huge video screens adorning each side of the stage, as the crowd chanted “Maiden, Maiden.” It was a virtual sea of fists and horns thrust into the air by a very amped up Los Angeles collective. The spot lights shined upon the figure of singer Bruce Dickinson, adorned in brown cargo pants and a black “hoodie” as he crouched on a ramp above the drum riser. As Dickinson sang the opening notes of “If Eternity Should Fail”, the opening track from The Book Of Souls, a gentle, increasing roar from the crowd accompanied the words “Here is the soul of a man” as the band kicked in full force about a minute later, and it was on! A huge “Mayan” style stage lit up the remaining members of IRON MAIDEN, flanked by Mayan towers on either side of the stage. As always, quite elaborate, and Dickinson used every inch of it, as he leaped about from above and beyond. The familiar cry of “Scream for me Los Angeles” kicked off “Speed Of Light”, the second of five straight new songs to begin the set. All well received by their adoring fans. “Tears Of A Clown”, another new one featured a patented IRON MAIDEN dueling guitar solo from guitarists Dave Murray and Adrian Smith. Third guitarist Jannick Gers seemed to be in his own world, spinning, throwing his guitar in the air, and generally putting on quite a visual, as the rest of the band labored and seemed a bit more focused. The epic “Red And The Black” was again, from a classic MAIDEN formula, a galloping 13 minute epic with lots of “Woah-O-Woah–O” sing-alongs on the chorus. New music not withstanding, this crowd completely went ballistic when Dickinson, appeared, again above the drum riser, this time sporting the crimson battle jacket and hoisting the Union Jack flag, as the band kicked in the opening notes of “The Trooper”, quite possible IRON MAIDEN's most popular live performance number. The energy in the building was electric. Again, Dickinson, was the main focus, and at 57 years old, and a man who has battled and beaten cancer, piloted the plane that carries the band and crew from city to city, and is still as energetic as he was 25 years ago, just makes you marvel at his youthful presence and outstanding vocal prowess. The title track to Powerslave was a crowd pleaser, and then it was back to new material. “Death Or Glory” again spotlighted the interplay between all three guitarists, as drummer Nicko McBrain kept the beat in check. “Welcome to the main event, my friends” Dickinson addressed the fully charged Forum crowd. “Be real nice on the way up, because you are REALLY going to need your friends on the way down.” The title track to The Book Of Souls was well received, and featured an appearance by the bands mascot “Eddie” who was dressed as a Mayan warrior, and had his heart ripped out by the ever present Dickinson, who continued his remarkable leaps and bounds and interplay with his fellow bandmembers all night long. Again it was back to the catalogue for “Fear Of The Dark” that had Dickinson cupping his ears to goad the screaming crowd to sing the chorus back to him, a huge smile on his face as the band soldiered on. “Iron Maiden” from their 1980 debut was performed, and with that, the band was firing on all cylinders. Bassist Steve Harris, his right leg perched on his stage monitor as is his custom, was in the driver’s seat, perfectly in sync with drummer McBrain, and all three guitarists continued to lay down big, fat, guitar tones that set this band above most others in their genre of the rock world. Not to be outdone, a HUGE “Eddie” appeared behind the drums and inflated, stood a good 20 feet tall, a snarling look on his face as expected. And his eyes exploded at songs end. This concluded a stunning set. The Forum faithful demanded an encore and after several minutes got just that. The narration intro to “The Number Of The Beast” was chanted along by most of the audience in my section, which included many women, a sometimes rarity at MAIDEN shows of the past. This was followed by “Blood Brothers” a song from IRON MAIDEN's “comeback” album Brave New World from 2000, and went over well with the fans, who could have stayed for two performances if it was offered. “Wasted Years” from the 1986 Somewhere In Time release, was the final number, and clearly the band was happy to give their fans a bit of the old, and were very appreciative of the acceptance of the vast array of new material that was performed. The band gathered center stage and bid farewell, as the audience, many of whom I’m guessing would be attending the following evenings performance, stood and cheered their heroes. An outstanding performance for a rabid fan base by a band that has been around for close to 40 years, with no compromise in the style of the “New Wave of British Heavy Metal” term that was laid upon them by some journalist of yesteryear. “These colors don’t bleed” Bruce Dickinson said, at a performance I witnessed many years ago. It still holds true in the case of the mighty IRON MAIDEN. As they exited the stage, the traditional ditty “Always Look On The Bright Side Of Life” from comedy troup Monty Python’s Flying Circus accompanied them, to the delight of their singing, sweat drenched, exhausted fans. The tour will hit a city near you soon. Don’t miss it.